This verse comes amidst Paul’s second epistle to the Church of Corinth, and here Paul was most likely referring to the apostles. Perhaps it was equally relevant to the believers of the Early Church, and almost as relatable to us modern Christians too (though perhaps in very different ways). Verses 8 and 9 of this chapter reads as one – however, it is notable that of the 4 pairs of descriptives used in these 2 verses, the pair in verse 8 focuses on the inner self; whereas the pair in verse 9 explores the external factors. In today’s study, we will focus on the internal, emotional issues that the apostles faced and examine how modern Christians like us today can still find comfort. At first glance this may seem to be an external factor – Paul seemed to be suggesting that the afflictions and trials that the apostles faced were caused by all sides. However, upon close inspection, this ‘hard pressed’ or afflicted nature points clearly to the apostles’ own inner well-being. 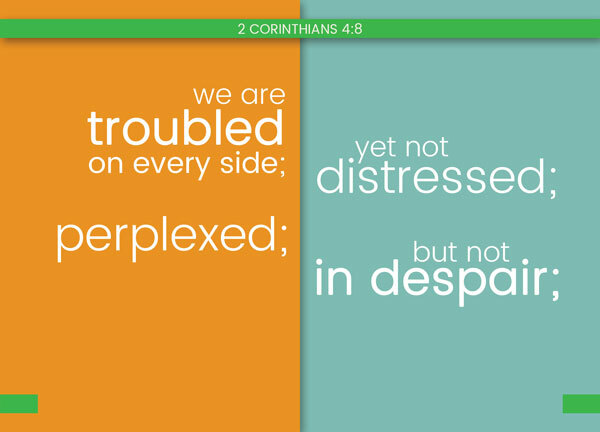 Our hearts are afflicted and troubled. We feel the pressure internally, whether it is caused externally or internally. It is an emotional reaction. It is an internal struggle to be afflicted. It is painful, it is difficult. The apostles endured a lot as they journeyed to preached the truth, rallied against sin and fought against persecution. We may not be apostles in the early church days, but as humans, we are often afflicted, and as Christians, there are many more reasons to be troubled. Unbelieving parents who threaten to disown us because we believe? That’s pressure, that’s affliction. Seeing a lovely young child pass away from a fatal illness? That’s troubling. Struggling with our spiritual and moral compasses, and hence, sins? There are a million more examples, and inexhaustible. The fact that Paul makes it so absolute – every side – affliction is everywhere, caused by everything, reminds us of the fact that we have absolutely no anchor on this earth other than our Lord. God is the only one we can grasp hold of, because everybody else could betray you. We are never free from one suffering or trial to another – and wherever we go, it is almost a certainty that negative things will happen. Rather, as servants of God we commend ourselves in every way: in great endurance; in troubles, hardships, and calamities [2 Cor 6:4]. When Paul, in his later years, wrote to Timothy his beloved student, and spoke about how his brothers in Christ deserted him, his spirit was not crushed – But the Lord stood by me and strengthened me, so that through me the message might be fully proclaimed and all the Gentiles might hear it. So I was rescued from the lion’s mouth [2 Tim 4:17]. perplexed – more often than not, despite all the degrees we’ve accumulated in life, despite all the zeroes we have in our bank accounts, despite the honours and the achievements, we find ourselves in situations that we don’t know what we can do. We often feel helpless, because in the face of certain troubles, we are really powerless and miniscule. When we are faced with decisions, there could always be that crippling fear that overwhelms us, as we struggle on which way to take, which door to close. Yet these are all temporal things, not eternal. We can also entertain confusion and chaos in our thoughts; doubts and fears can grow in our hearts about the gospel, especially when the devil has a foothold. At some point in his ministry, the apostle Paul also told the Church of Galatia, in his exasperation, that he was perplexed about them [Galatians 4:20]. Surely many a minister today feel the same about their half-hearted or wayward congregation. but not in despair – perhaps there is nothing they could do; perhaps they found themselves helpless, not knowing what to do next. However, they were never hopeless. They always retained hope, and never gave themselves up to despair. To the apostles, their greatest mission was to spread the gospel to all the people – and hence they have no reason to ever despair in this work that they are doing. Simply because the second coming of Christ is a certainty, just as their salvation is a certainty. Even if people rejected the gospel that they preached, they knew that the gospel stood tall and was defended. And perhaps the most important reason is that God is here. There is hope. Perhaps the trend for modern Christians nowadays is that we are slightly troubled by a couple of sides, and we are crushed; perplexed and helpless by the lot we were given, and end up in despair. There is a huge contrast when comparing the young, talented modern Christians to the ancient Early Church days. At least where I live, there is little persecution or repercussions to freely choose to believe in God, and spread the gospel. Yet as I was reflecting on this verse, an incident happened in my family. Yesterday, when we were all in Church, we received news that one of my uncles had collapsed and was sent to Emergency. It was much later when there was finally more clarity on the situation, and skipping the confusing medical terms, he basically had too much blood pooled in his left brain, and the doctors said they cannot do anything. He was an elderly man, left to die slowly while unconscious. The doctors gave him 2 days, at most. I come from a Chinese family, in a very superstitious culture. By virtue of one of his three sons being a matured Christian, A pastor came to pray for him last night. However, not long after the pastor left, a Sri Lankan monk came to pray for him. Today, a Nepalese monk dropped by, and another famous Chief Monk from a local temple. Seeing the cousin today, his physical, emotional and spiritual exhaustion was evident. Unable to go against the wishes of his mother and overrule his elder brother, he could only watch. Yet when he spoke to us, his voice trembled and conviction shone through his eyes – ‘we can only hope that in his last conscious moments, out of the things that he thought about, one could be the little he had heard about God, the life testimonies he had seen in us, and that God can use it for good’. It is oppressive, and it is perplexing. Yet, I see that he isn’t crushed, and he isn’t in despair. Perhaps it is too late for my uncle, but God is still here, and there is still hope. Let our spirits not be crushed, even if we are afflicted on every front; even if we’re fighting spiritual battles again and again. We can only pray for little mercies.